I'm crazy about watermelon and grilling it takes it up a notch. The sweetness of the fruit is enhanced by cooking on the grill and gets a wonderful smoky flavor. We mix it with creamy feta and herbs for a light and refreshing finish to a BBQ. Or try it chopped into my grilled Chicken and Spinach Salad. It's so good! Heat a gas grill to medium. If using a charcoal grill, start the charcoal; when the briquettes are ready, distribute them evenly. Be sure to oil your grate first. Brush a little honey on the watermelon slices and grill 2 minutes with the lid up, then turn over and grill for 2 minutes, brush again and cook until grill marked. Toss in a large bowl with the rest of the honey, herbs, feta and balsamic vinegar to taste. Chill before serving. Season your chicken thighs with spice rub (recipe below) in a large bowl, cover with plastic wrap and place in fridge for about an hour or two to marinate. Combine the spinach, onion, feta cheese and olives in a large bowl. Whisk together the oil and vinegar in a small bowl; add the salt and pepper, set aside. Slice the chicken and place on the spinach. 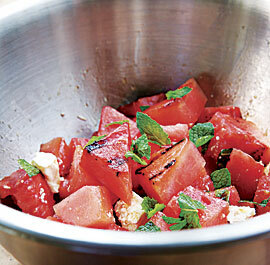 Add grilled watermelon, (warm or cold) if using. Love your recipe for grilled watermelon and chicken spinach salad! It looks very delicious and colourful! Stopping by your blog from Allergy Free Wednesday (I posted #85 - Mango, Banana and Chai Tea Smoothie).